It’s Crystal here and I am so proud to be a part of this blog hop ,OWH is dear to my heart , I grew up a daughter of a Master Gunnery Sergeant in the Marines and very proud of it , sometimes my dad would be away on missions and back then, there was no internet to Skype with my dad, so letters from him were very precious and once in awhile my dad would send a cassette tape to us ,hearing his voice was extra special . So I know how much these cards mean to the military and their families waiting to hear from them.I hope you can take a few minutes and hop along to see how creative all these ladies have been knowing they will touch someones hearts , I love that we are in a small creative way putting a smile on the military service men and women and their families ..
Visit each blog by clicking through the designers and organizations listed below. Each blog will also have a link to the next for easy hopping! Comment on each blog you visit to show some love to those participating! Art Impressions will also be giving away a $50 prize pack of Art Impressions products. To enter, comment on every blog listed, the more you post, the more chances to win! The winner will be announced on Monday at 3:00 p.m. PST. I really like the polka dots in the first card. Very cute ideas. Cute cards. I like the clean and simple look to these with the new Ai stamp sets. I love the first one with the color bubbles. This is a colorful one! Thanks for supporting OWH in this blog hop! My favorite card is the pink heart with the cross stitched borders; it’s such a sweet card that I can see a hero choosing for his wife, daughter, or mother. Thanks for sharing! Thank you to your family for their service! WOW- you really outdid yourself; nice job!! I like all the cards a lot but the first 2 and the last one kind of surprised me – in a good way- as I wouldn’t have thought to do that with the stamps. The first 2 designs and the last with that busy paper but they all work nicely!! Thank you so much for your support of OWH!! Love the Sending Love card – the heart & the stitching are wonderful. I love your coloring, the chevron paper and how you decorated the insides. 🙂 These stamps are so cute! Very cute cards! Love the bright, cheerful colors. Such pretty cards! Love the story of your dad too! I love the first card! The dots remind me of balloons- gonna have to use this idea for a birthday card. Great use of the stamps! These are all so wonderful! I can’t believe you made so many. That’s great! I think my favorite is the one with the girl wearing the pink top with the polka dots behind her. I like how you used a banner for the sentiment on the ” Thanks for wearing all the hats” card! Wow, so many creations. Great work. Love the banner style you use, especially inside the card. Great idea. I am having so much fun picking up all of these ideas! Such fantastic cards! 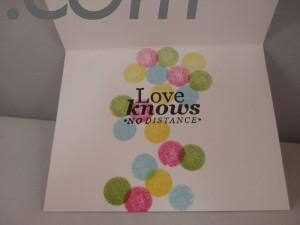 Cute idea to break up the “love knows no distance” stamp. Thanks for sharing! Wow!!! GREAT cards!!! I love the use of the colors in the first card!!! Great Job!!! Thank you for supporting OWH! Just love all the cards you made here, the colors, style are so fun. TFS. The color dots are just great on the card. thanks for making so many cards as it helps to visualize hte different ways to use the sets. really like the polka dots–which I may case..
Wow what great cards using the new stamps. wow- what a great variety of cards- thanks for showing so many ways to use the stamps! And thanks to you and your family for their sacrifices and service to our country!!! I love the stamps! The cards are so fun. Great cards! Love the colors you used on these. Thank you for supporting OWH! Very creative cards. I like the subtleness of the white and soft pink one best. Love all of these designs! Thanks so much Crystal for sharing your cards! I’m so glad that AI has done this for us at OWH. 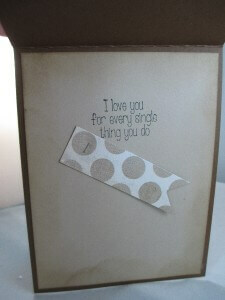 I love your “sending love” card with the cute dots! What a fun idea. Happy blog hopping! Yes, the stamps are wonderful and so are your cards! It’s hard to pick a favorite. And I love the clean & simple ones! Very nice cards, thanks for the ideas. I love your use of dots! Great cards using these new sets. Love the polka dots on the first card. I love your cards! The colors and the variety are giving me lots of inspiration. Thank you for supporting OWH! I love the creative ways you used the stamps…your cards are great. 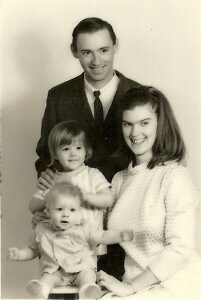 Thank you for supporting OWH, and thank you for sharing your story about your Dad…tell him thank you for his service. Love what you did with the all hats stamp. Great card backgrounds and color choices. Love the card with the heart. Thanks for supporting OWH. Great ideas. LIke the various techniques you used. Love! Love! Love! all the cards. I love the inking you did with the heart. Adorable cards and great coloring. I love OWH. Great use of those stamp sets. I adore the wonderful and unique ways you used them. You came up with so many creative things, it was just like having many more stamp sets. And, very nice the way you connected the inside to the fronts. Love them! All of your cards are great. I especially like the first one with dots. Love the polka dot idea! You got so many different looks from these stamp sets – great job. My favorite is the one with the chevrons n oval mat. Wow what great cards! 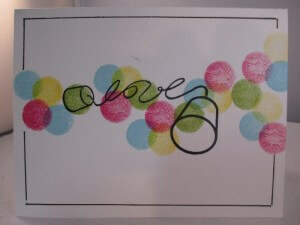 Especially love the little color dots with the sending love card! You are so good with the banners and bows. i’m still struggling to get the bows made nicely, but working on it! Goodness!!!! Lots of awesomeness on this post. Your hat lady cards are sooooo impressive, and your card designs are very clever! Great cards. Love the many colored stamped dots. Awesome cards!!!!!!!!! I looked at the blogs at 3:00 AM Arizona time! Then went back to sleep – I don’t want to miss any gorgeous cards! What fun cards! I really like the designs you’ve done with the cups set. I was a little stumped on it and am so happy to have the inspiration. Thanks for support Ai and Operation Write Home. Cute cards, love the pink heart and that stamp set. What a good colorist you are. These cards are terrific. You did a fabulous job showcasing the new stamps, Crystal! What a great group of cards! Super fun. Really cute set of cards. I love the scattered dots and the heart for the cup cards. The ladies are all so stylish – love that pink chef’s hat! Thanks for supporting OWH! Cute cards and very unique ideas! Thank you for supporting OWH! Your cards are super! I loved the hat lady with the polka dots behind here. I especially liked the way you placed the sentiment. 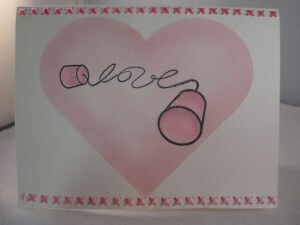 Your pink heart card is the first time I’ve noticed the string between the cups spells love. The simplicity of the card made the stamp shine. A big thank you to you and your family for the sacrifices you made while your Dad was away. Cute idea for the walky talkies. Thanks for sharing a family story. You have made wonderful cards to share with others. Love your samples, so much inspiration. Love the family photo!! Thanks for showing us creative ways to use the stamp sets!! Thank you for all the amazing inspiration, Crystal! And thank you for sharing your story! It’s amazing to pass on your cards now to those waiting to hear from their love ones. Thanks again for joining in the hop! Really pretty cards. Love the all hats lady. 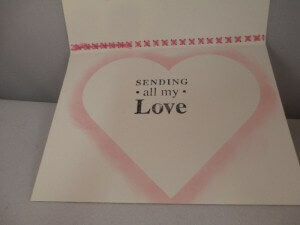 Love your fun cards, especially the Sending Love ones! What a cute stamp set! Your cards are absolutely beautiful! The card with the different color dots and the cups had me hitting palm to forehead! I just had no ideas for that – and yours is GREAT! love the buttons on the side of the hat woman – awesome idea……. When I saw her – I saw sassy woman! I think she is every woman! The positive and negative inked hearts on the sending love card are very clever. Love your cards! Thanks for sharing! And thanks for supporting OWH! 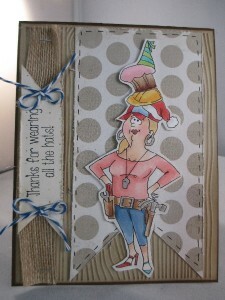 Love the “every hat” gal, adorned with grommets and wood-grain! You did a lovely job with the sponged cards, too. Thanks for your support of OWH. Great cards. All of them. thanks for sharing about your family. Your cards are so fun and I really love the first one with those stamped circles and the Sending Love set! Love the dots. They look like they are dancing. 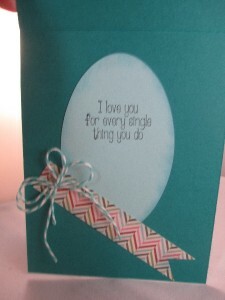 Love all your cards….the chevron background is fabulous!! Über cute!! Great cards I really love all the colorful circles with the stamp. Very nice cards. Thanks to you and your Dad for his service! Love the new sets and the cards that you created with them. They are going to be fun to create with! Love all the cards, but my favorite is the first one. Thanks for supporting OWH. Wow, Crystal! So many ways to create cards using these stamps! Thanks for the awesome ideas! So many cute ideas- great idea to finish the inside of the cards as well. I enjoyed the variety of cards made from one set of stamps! Thanks to your father for his service and to you for continuing to support the military. My favorite feature in the cards you posted is the way the inside and outsides of the cards coordinate – especially the pink heart – one to CASE for sure! Wow! Love all the polka dots! So cheery! Love all your cards especially all the stitching, real and faux! Thanks for being a part of such a special blog hop!! Great cards! This is such a wonderful idea. Your cards are terrific and will bring a smile to the lucky person receiving it. Love Love Love all the coloring! Love love love the polka dot action!!! And the hat card is super cool too! Awesome creations my friend!!! What awesome cards! I LOVE the heart love card! Wow! Love all your cards but if I had to pick a favorite I think it would be the hat card with the polka dots. Thank you for the service your family has given for our freedom…and for your support of OWH.